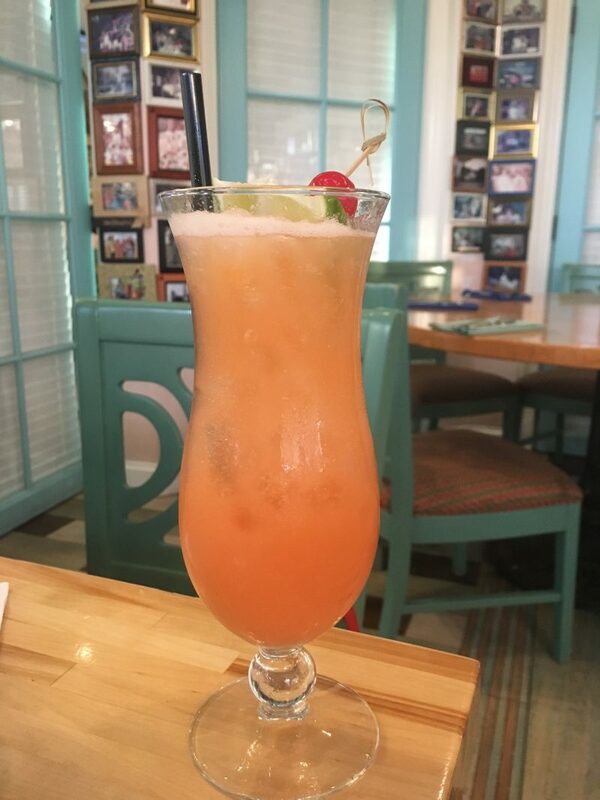 Olivia’s Cafe at Disney’s Old Key West Resort is no spring chicken. 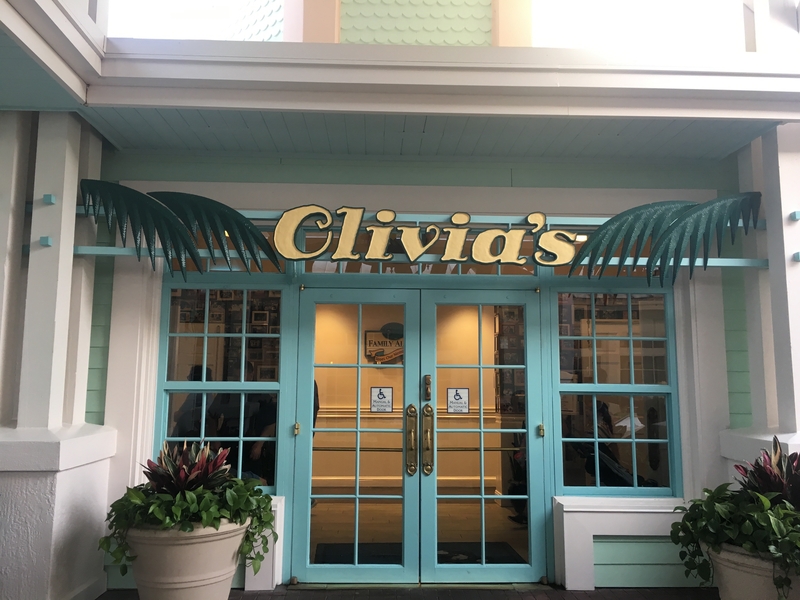 Opening more than two decades ago, Olivia’s may not be the new kid on the block, but this somewhat hidden Disney gem with mouthwatering food will never go out of style. Words like glamorous or trendy may not be the first to come to mind, be that as it may, the restaurant is a class-act with a comfortable, family-friendly atmosphere, a laid-back Florida Keys feel, and filled with staff that make everyone feel at home. After my recent dinner here, I can’t help but wonder – Why don’t I come here more often? A Friday night outing with close friends on vacation from New Jersey, during the typical chaos of spring break in Orlando, at the most sought after vacation destination in Florida, can be stressful to say the least. Layer in five energetic children that have spent a very long, hot day in the park, finding a place that is family-friendly but also appealing to a grown-up’s palate (not that I don’t enjoy Disney’s chicken fingers and mac-n-cheese) was a must for all of our sanity. In a uniquely Disney way, Olivia’s Café came to the rescue! After the typical musical chairs that comes with a large group trying to navigate a restaurant table, we take our seats. The kids are all happily plugged-in to electronic devices (desperate times call for desperate measures), and the first question our cheerful waitress asks – Would anyone care for a drink? All four adults answer in unison – Yes!!! I ask the waitress, as a foodie usually does, to please bring me one of their most-popular, signature cocktails, and a few minutes later, she gifts me with a Turtle Krawl. This sweet, but not too sweet cocktail tricks your senses into believing you’re lying on a white-sand beach, and not watching your son spill his entire glass of soda all over the table. Pineapple and orange juices blend nicely with the tang of lime juice, while three different rums (because one is never enough) marry together in beautiful coconut rum, spice rum, and white rum harmony. As the Turtle Krawl works its magic granting peace among us four, the waitress suggests many appealing appetizers, but when she says onion rings from the “secret menu”, that’s it! Onion rings are most often a good pick to begin with, onion rings from a “secret menu”, they have to be even better…and yes, they were amazing! 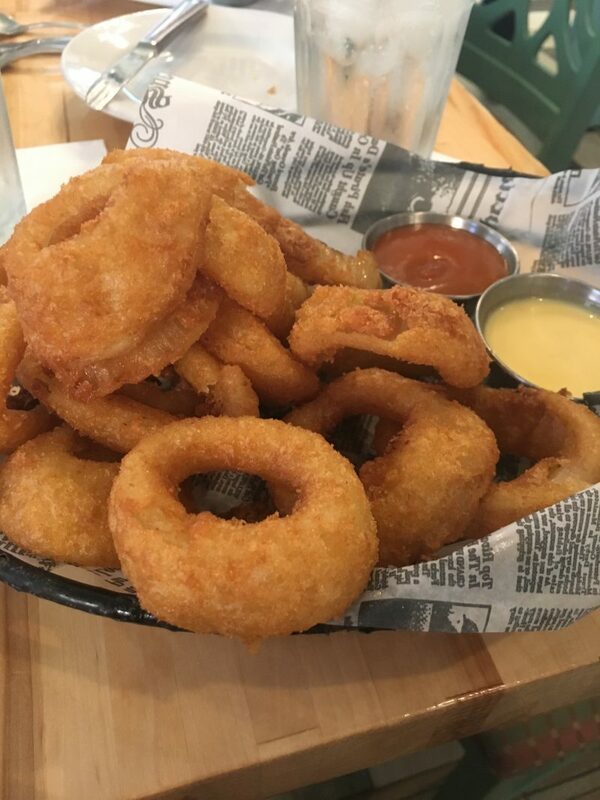 Crunchy, salty, fried, golden rings with a pop of sweet from the cooked onions. We ate our “secret menu” onion rings feeling like VIPs. Well, that was us, until we slowed down enough to look up from our munching to see that several other tables also had them. The jealously subsided faster than it was felt, most likely because of how delicious these secret menu onion rings are. When it was time to order our entrees, I perused the menu of several dishes that I imagined were all incredible: Plantation Key Pork Chop, Tortuga Seafood Stew, Seven Mile Sea Scallops. Finally, after several minutes of waffling, I asked the waitress, yet again, for Olivia’s most popular entree, and she recommended one dish that gets a lot of attention: Southernmost Buttermilk Chicken. After eating this dish, I can clearly see why this southern jewel is the most popular girl in the class, and not in a mean girl kind of way. Boneless chicken breast so tender, I envision it marinated in the buttermilk for days, and so delicate I barely used my knife to cut it. The chicken’s crispy exterior is perfectly complimented by the southern gravy that has a perfect amount of spice and is smooth as silk. 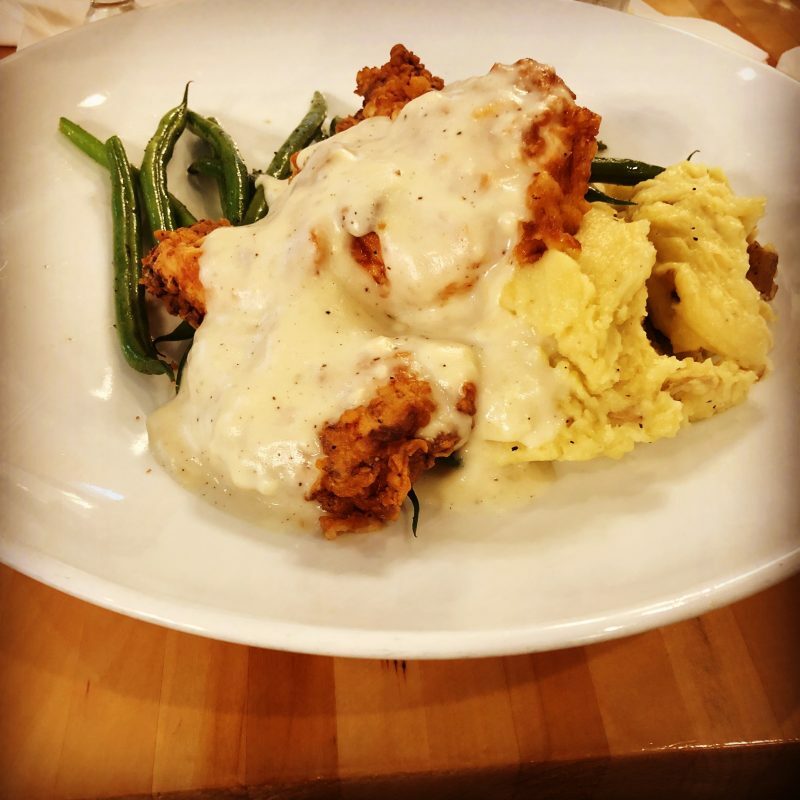 Tender and crunchy chicken, creamy southern gravy, nestled on top of crisp green beans and buttery, smooth mashed potatoes. Comfort food to the max. I managed not to eat my entire dinner plate, considering the fact that I wanted to unbutton my jeans, a clear warning sign of when to stop, but…there’s always room for dessert! Our waitress made the kids’ day with DIY sundaes, and she made my day with Banana Bread Pudding Sundae. It was so sweet of her to bring my husband an extra spoon to share, and he really did put up a good fight, but that dessert had my name written all over it. 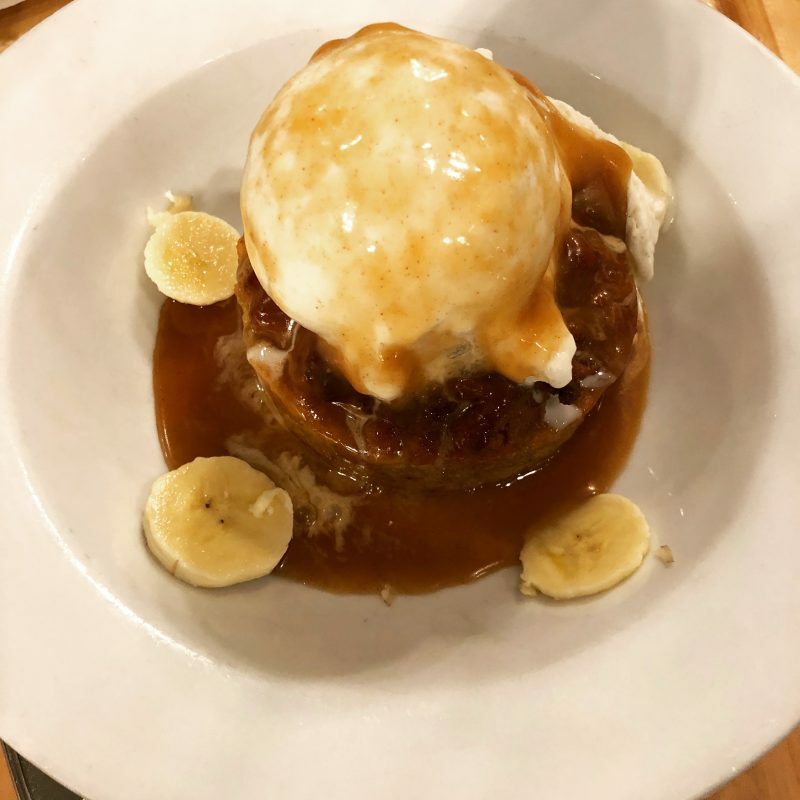 A warm bread pudding with a Bananas Foster topping and a scoop of vanilla bean ice cream that slowly melted on top…heavenly! The bread pudding was moist (sorry, I hate that word too), the bananas foster was syrupy and luscious, and the ice cream was velvety, sweet. A perfect ending to our dinner. A successful dinner in the books, I will not let too much time pass without returning to Olivia’s Cafe. Kids, or no kids, it is a perfect spot for a delicious meal and a serene atmosphere. A classic Disney resort restaurant, I hope you venture to soon, and if you’ve already been, go again…and order the Turtle Krawl.